I am so blessed to have these girls in my life! We’ve known each other since the 8th grade (some even before that) when we found refuge in each other in the middle school cafeteria. We got each other through all sorts of stuff: lousy boyfriends, acne, parental issues, tests, nervousness at talking to cute boys, dorky clothes, watching Tom Cruise movies (he was the ultimate! ), graduation, and all that teenage angst! Then we graduated and somehow we managed to stick together through our girls night outs. And we again helped each other through all the drama of our 20’s: some of us went to college, some of us worked, we all got married, we helped each other through miscarriages, fertility issues, the death of a child (we’ve lost six babies between the five of us) and death of a parent, birth of children, one of us moved to a different state, and now we are all trying to raise kids who aren’t bratty! And, here we are, all turning 30 in the next year! There’s just nothing like the friendship of girls who’ve known you almost all your life and love to still hang out and eat pizza and ice cream…and gab! And I’m sure we’ll stick together through our 30’s and beyond! You are lucky to still be so close and live near each other! I sometimes wish I lived close to my nearest and dearest but they are scattered; oh well, what do you do? 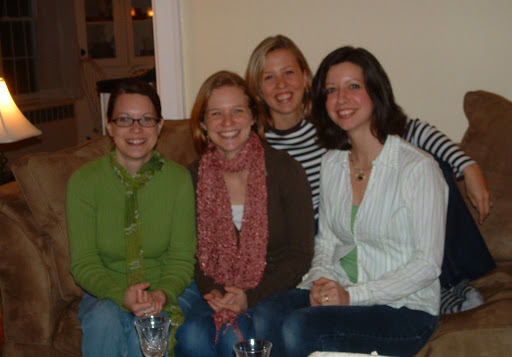 There is nothing like childhood friends… the ones that saw you through your teenage years! I know I cherish my childhood friends. When we’re together it is just so comfortable.